Join and receive your copy of IWN! This forum is currently read only. You can not log in or make any changes. This is a temporary situation. From our correspondant and photographer James Burke! "Herewith a shot of the Heritage Barge, 77M, formerly used as a floating crane at Fenniscourt Lock on the Barrow. WI got in a huge 130t crane to lift her to dry land but the weight was too much once the crane arm (jib?) was extended so they are getting a bigger one. They need to raise and swing the barge over the fence and every metre extended adds 8 tons to the weight, according to the crane driver. He could lift her vertically but not over the fence, which would mean extending the crane. They lifted the barge slightly to weigh it and it is over 70 tonnes. It has a hold full of poured concrete which was used as ballast for the crane and also for repairs over the years, under CIE mostly. She is now being pensioned off and will be stored in their yard next to the lock. In the landscape picture, John O'Neill (in hard hat, foreground, looking this way) looks on at the first attempt to raise the barge. He would welcome any information anyone has on the boat. She has a Perkins engine rather than the standard Bollinder, plus the Priestman crane. Next attempt to raise her is tomorrow Friday." Well here's a bit of info. on 77 to get the ball rolling. Looks daft to me. It wouldn't be too hard to break her back. The first thing I'd do is remove the crane from the bow. One bargee I know ,many years ago,when the canal was closed due to a breach, used two cranes to lift his barge onto a trailer. That way there would be four slings holding her rather than two. over rough ground..... believe me I know...!!! Why is it being moved?
"" Perhaps they're afraid that whoever eventually buys it will start dredging operations...LOL""
can you imagine the health and safety regs on that hehehehe it would be worth doing just to see their faces. one of them tried to "instruct a (old) fisherman how to lift a fish box" in kilmore reciently. luckly some one was able to restrain the man . hobby activities Mick, or we'ed all be put off the water.....!! Presumably restoration and conversion to a useable boat is the goal here. Reduction in weight would seem to be a proirity, and dismounting of the on board crane and hacking out most of the concrete from her bilges might be the way to go. I'm wondering if our Fenniscourt correspondent got any photos of Friday's effort? The suspense[ ] is killing me. I went down on Friday to hav a look. They were waiting for a second, larger crane to arrive, but didn't think it would happen on Friday. Havn't heard anything since. "Ah shure it'll probably hold her, Boss...."
Yes Mick I use it as a temporary stern line when casting off singlehanded - it floats so i don't have to worry about fouling the prop. But Breakaway only weighs 3 tonnes. If they need a 130 tonne crane to lift the barge I doubt if (?10mm) nylon line could hold it if it got moving. it or not is a seperate issue, but not really dependant on "string" size. Doesn't String Theory usually work in an 11-dimensional manifold? 77m was lifted today by a 180 ton capacity crane. The driver said she weighed between 73 and 78 tonnes. Thanks to John O'Neil for letting us know when the lift was happening. 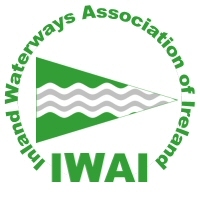 All content is Copyright © The Inland Waterways Association of Ireland - all rights reserved. Caveat lector! - Information is provided by IWAI in good faith. Website feedback, errors, corrections etc. are always welcome. As a voluntary organisation, we are always happy to welcome new members or receive donations. You can join on-line today. 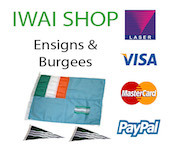 Alternatively, you can donate by Laser, Credit Card or Paypal if you're feeling generous or appreciative.